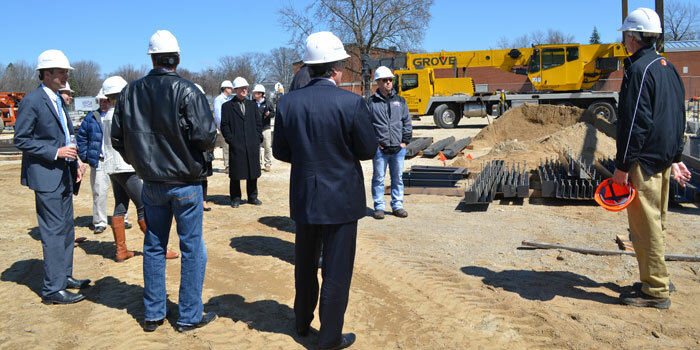 WARSAW — The Warsaw Community School Board saw firsthand the progress on the design build project coming to fruition. Project supervisor Jim LeMasters took board members on a location-by-location tour, explaining each step of the project so far and describing what will happen next. Donning hard hats, the board first stopped at Lincoln Elementary School, where a new building is being constructed. Steel framework for the gymnasium is up and board members were able to see where classrooms, hallways and even the elevator shaft will go. The next stop was Edgewood Middle School, where most of the interior has been redesigned. Work is progressing in sections, with as little disruption to the academic process as possible. The new science area currently under construction and the ground broken for the new STEM lab addition. Next door, at Washington STEM Academy, the board saw the bricks chosen for the new STEM lab addition, which closely matches the existing brickwork. They also had a brief tour of the cafeteria, where ceiling removal revealed skylights. There has been some discussion about keeping the ceiling and skylights uncovered. Work on Washington and Edgewood is slated for completion next fall, while Lincoln is set to open its new doors around January, 2017.